Frying beans with a bit of fat and onion accentuates their rich, creamy quality. Feel free to increase the lard for a richer, more authentic refried bean. Remember that if you don’t eat refried beans with lots of meat or protein, the overall proportion of fat in the meal isn’t unhealthy. 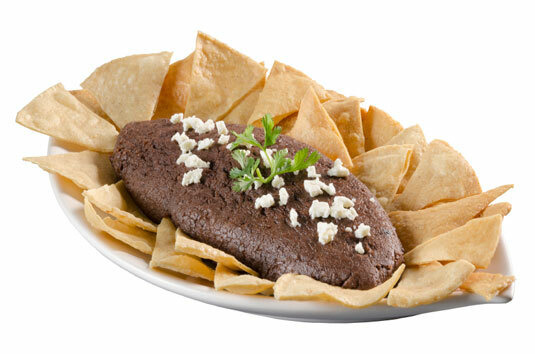 Refried black beans shown with tortilla chips for dipping and topped with cheese. Place the beans and water in a large pot and bring to a boil. Cover, reduce to a simmer, and cook for 1 hour and 15 minutes, or until the beans are tender and creamy in the center. (To test for doneness, taste 3 or 4 of the smaller beans.) Crush the beans in their liquid with a potato masher or the back of a wooden spoon. Heat the lard or vegetable oil in a large saucepan over medium heat. Sauté the onion with the salt and pepper until golden, about 10 minutes. Add the beans and their liquid and continue cooking over medium heat, stirring frequently, until the liquid evaporates and the beans form a creamy mass that pulls away from the bottom and sides of the pan, about 15 minutes. Serve immediately. If you’re lucky enough to find epazote, add a sprig or two to the pot of the refried beans for the last 15 minutes to give the beans an authentic flavor. Epazote has also been known to counteract the unpleasant side effect of beans on the digestive system!